While talking to the media at an award show recently, Sara Ali Khan addressed Shah Rukh Khan as 'uncle'. SRK's fans slams her for being unprofessional now. Social media went into a tizzy recently when a video of actress Sara Ali Khan speaking at an award show surfaced. The video had her recalling the time when his father and actor Saif Ali Khan used to host Filmfare awards with actor Shah Rukh Khan. The catch is not that though. It’s how Sara is addressing SRK in the video. 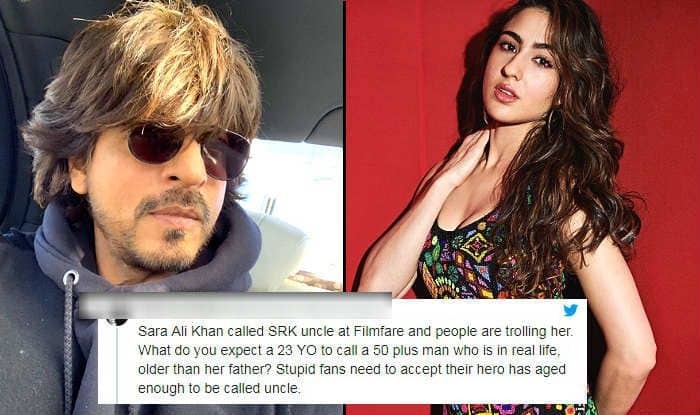 Many Twitter users called out Sara for sounding unprofessional while some protected the actress by saying that SRK is elder than her father, therefore, it’s just fine for Sara to be addressing him as her uncle. Neither Sara nor SRK has reacted to the issue yet. The actress went on to bag the Best Female Debutant trophy at the Filmfare this year. On the work front, she is busy filming Imtiaz Ali’s next with Kartik Aaryan currently. Expected to be titled as Love Aaj Kal 2, the film was recently announced by the stars themselves on social media. It’s a love story and the Delhi schedule of the shoot has already been wrapped up.